Grease 6 half cup moulds. Stir cream, milk, white chocolate and 2 tablespoon of sugar in a small saucepan.. stir over medium heat until smooth(without boiling). Sprinkle gelatine over water in a small heatproof jug. Stand jug in a small saucepan of simmering water.... stir until gelatine dissolves. Add the gelatine into the cream mixture. Divide among moulds. Cover and refrigerate about 3 hours or until set. Combine dessert wine , passionfruit and remaining sugar in a small saucepan and bring to boil. 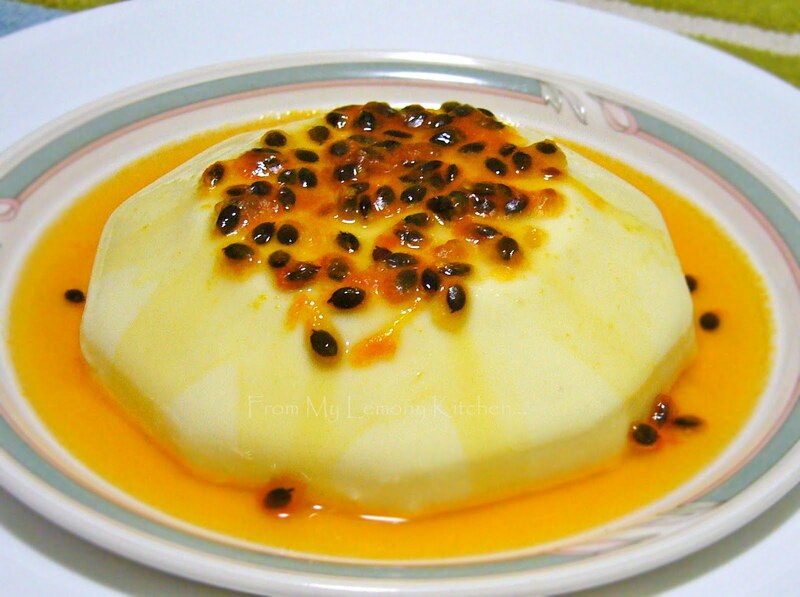 Reduce heat, uncovered, without stirring about 10 minutes or until passionfruit syrup reduced by a third. Cool. Turn the pannacotta onto a serving plate...and drizzle with passionfruit sauce.